Abstract: The Delaware County SWCD collaborated with the Delaware Muncie Metropolitan Planning Commission and the Delaware County Department of GIS in ranking 265,000 land parcels in East Central Indiana for ecological significance. As a secondary analysis, the DCSWCD narrowed the land parcels based on desired conservation/recreational usage; such as wetland creation, canoe/fishing access sites, and forest preservation. The resulting refined list of parcels will guide direct mail/ phone calls in connection to 2013 conservation practice marketing. Red indicates 1/4 acres that had a ranking greater than 8 on a 1-13 scale. Yellow represents clusters of parcels that have some form of existing conversation (i.e certified forest or other type of tax exempt status) and/or wetlands. The WRWP facilitated students and local professionals (Muncie Metropolitan Planning Commission, Delaware County Department of GIS) in developing a GIS program that ranks Delaware County land parcels and selects sites based on conservation and/or recreational intention and suitability. The DNR conservation project utilized an existing study done by DMMPC that identified and ranked ¼ acre land parcels in Delaware County for their ecological significance and their conservation potential. 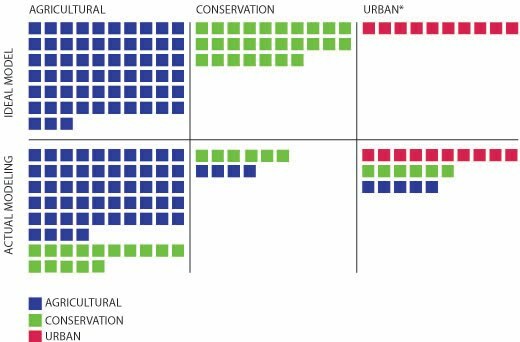 The WRWP then ranked lands based on their degree of farm-ability and/or their suitability for conservation. Thus, the project helped prioritize and target lands that would be suitable for conservation but would not take away from agricultural systems. The WRWP created a secondary layer of analysis in which GIS narrowed the 265,000 parcels down based on desired recreational usage, such as wetland creation, canoe/fishing access sites, and forest preservation. The resulting list of parcels provide to be a manageable amount for direct mail/phone calls which will be included as part of the 2013 marketing. Presented to Indiana DNR leadership, Local NRCS, and the Red-tail Land Conservancy the work will guide these agencies in identifying target lands suitable for conservation. Supplemental funding expanded the study to a seven county region. The intent of this analysis was to discover land parcels that are problematic for farming (soil type, hydrology, erodibility, wetlands, floodplain, and slope). Basins/stretches of parcels that have been historically problematic for farming tend to be less modified. The WRWP overlays layers of GIS information to highlight the most naturalized sites/basins. When we identity stream segments, irrespective of drainage, but in our scope areas, we find additional streams to use as reference reaches. (Because of the nature of the regional curve, this isn’t always a problem). - 260,000 parcels in 7 county regions were analyzed for their conservation potential. -Contact lists were generated based on conservation and/or recreation potential. - Research helped facilitate BBF and DNR partnership. - Recreational opportunities get people outdoors where they experience nature; enjoyable experiences create a certain level of ownership and commitment to the preservation of recreational amenities as well as the development of additional amenities. - Open space and Recreational opportunities provide both social environmental and even economic leveraging. Communities with recreational amenities are sought after in the redevelopment and relocation of businesses. - BSU students began a pilot process of identifying recreational areas along the White River and other major tributaries to increase fishing and canoe access locations. - Determination of hunting grounds, wetland creation, and agricultural land conservation in high development zones follow a similar process. - GIS process highlighted parcels that might otherwise be overlooked as having recreational/conservational qualities. - Allow better suggestion of high farmable lands, non-farmable lands thus high priority development and conservation lands.